The Weill Cornell Brain and Spine Center is committed to education — not only for medical students and residents but also for other physicians and neurosurgeons worldwide. 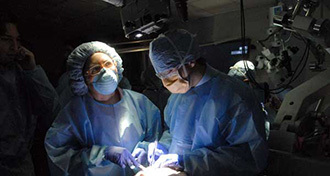 Our Continuing Medical Education courses cover research updates as well as state-of-the-art techniques in minimally invasive brain and spine surgery, transnasal approaches to skull base surgery, and other endoscopic surgical procedures. See the current list of upcoming courses, events, and patient seminars. Advanced Endoscopic Skull Base and Pituitary Surgery: Hands-on Symposium is a comprehensive overview of the newly emerging field of endoscopic skull base surgery, combining didactic sessions with hands-on cadaver dissection, as well as panel discussions. The course directors are Theodore H. Schwartz, M.D. and Vijay K. Anand, M.D. Complex Surgical Approaches to the Skull Base is a hands-on cadaver workshop with three-dimensional virtual reality workstations. This course takes place in our state-of-the-art Surgical Innovations Laboratory and is directed by Neurosurgeon-in-Chief Philip E. Stieg, M.D., Ph.D., and Antonio Bernardo, M.D. For more information, email skullbasecourses@med.cornell.edu. 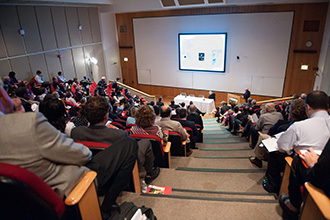 In addition to these annual CME courses, the Weill Cornell Brain and Spine Center offers a variety of one-time courses and other non-CME events. See schedule of conferences, and meetings for faculty, residents, and fellows. Would you like to hear about upcoming CME courses and other events? Sign up for our email list. We will not send you spam; we will send only emails (a few times a year) letting you know about our educational offerings. See the schedule of upcoming CME courses and other events, with links to online registration. Weill Cornell Medical College is accredited by the Accreditation Council for Continuing Medical Education (ACCME) to provide Continuing Medical Education (CME) credit for programs that are developed by Weill Cornell faculty as part of the medical school's overall program of CME. All applications therefore must meet both Weill Cornell and ACCME guidelines for CME activities. The Office of CME is available to answer questions and assist with aspects of both conference/course planning and the CME application procedure. Questions should be directed to Ms. Juliet Singh-Doncell, Administrator for CME at (212) 746-2631.